In need of a universal style muffler to build a custom exhaust system? Check out our Megan Racing mufflers that are available in many styles and configurations. Additionally our universal mufflers allow you to create your own custom exhaust system that suits your exact style and needs. All Megan Racing mufflers are constructed in lightweight T-304 stainless steel with cnc machined flanges, tig welds and features exceptional quality. In conclusion these mufflers do a great job at completing a custom fabricated exhaust system. By choosing the style you prefer most you can end up with a one of a kind exhaust that meets your styling, sound and performance needs. In other words these mufflers are going to impress you with their quality! Applications are available in 2.25″, 2.5″ and 3″ models. Do you need a test pipe for your performance vehicle? Check out our Megan Racing test pipe upgrades. To achieve maximum power especially on turbocharged applications a test pipe can unlock horsepower. The catalytic converter robs you of valuable power that can come in handy at the race track. A test pipe restores this lost power by flowing straight through. Megan Racing offers test pipes that are a direct bolt in installation. Simply unbolt the stock catalytic converter and bolt in the new test pipe. All test pipes are stainless steel and feature CNC machined flanges and clean tig welds. Megan Racing test pipe kits also integrate the OEM style bungs for O2 sensors. Finally these are the perfect compliment to customers that have already upgraded the cat back section of the exhaust system. In other words this is the perfect finishing touch to a fully upgrades performance exhaust system. In conclusion these test pipes are not legal for street use and are designed to be used off road or on a race track. Please check local laws regarding the modification of the exhaust system by checking the vehicle code for your state. Many states are more stringent on exhaust modification laws and to pass SMOG. Please check your local laws. In need of a performance down pipe for your turbocharged vehicle? Check out our Megan Racing down pipe applications. A performance downpipe replaces the factory downpipe with a straight through design. Additionally the increased diameter pipe improves overall exhaust flow and turbo response. Each Megan Racing down pipe features stainless steel construction and CNC machined flanges and OEM style bungs for O2 sensor. An aftermarket down pipe produces big gains in forced induction vehicles and will yield usable power increases in normally aspirated vehicles as well. When a down pipe is installed your ECU tuning will need to be optimized for maximum performance. For instance to avoid a check engine light an ECU tune and/or o2 spacer may be required. Secondly we use T-304 stainless steel for all of our downpipes. In conclusion upgrading the down pipe is one of the most critical upgrades when wanting to extract maximum power from a turbocharged vehicle. In other words get ready for some hp gains when you upgrade with a Megan Racing Downpipe! Are you looking to buy headers for your vehicle? Check out these Megan Racing headers we offer for sale. Megan Racing Stainless Steel Headers are made of thick T-304 Stainless Steel and are mandrel-bent to form and fit your particular application. Additionally our stainless steel headers feature thick flanges and strong welds prevent cracking for long-lasting durability. 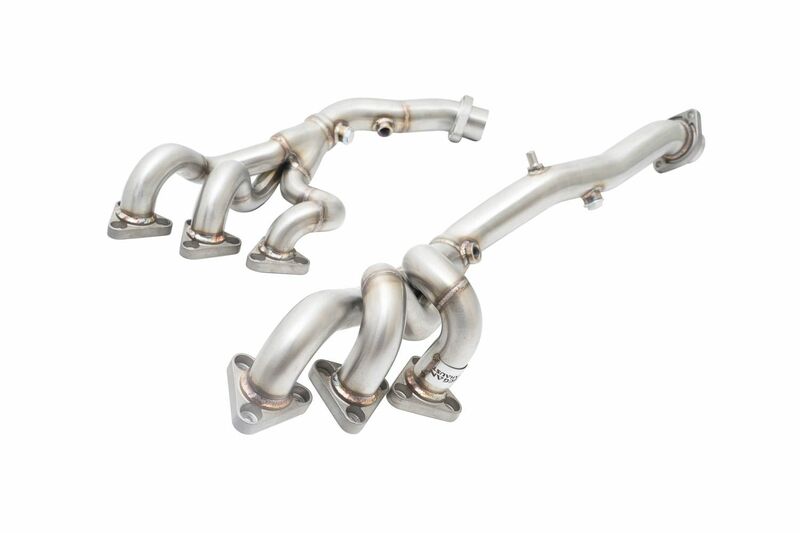 Our stainless steel headers help your engine maximize its performance by improving exhaust flow efficiency. Therefore the exhaust gasses flow easier resulting in gained power and performance. Finally all our headers are tested to fit with OEM spec downpipe or aftermarket downpipes that feature OM style flanges. In conclusion the installation of Megan Racing Stainless Steel headers will dramatically improve the flow of your exhaust system and produce significant power results. In other words these headers are an exceptional value with quality you can trust. ** Check your local laws before modifying your vehicles exhaust system. 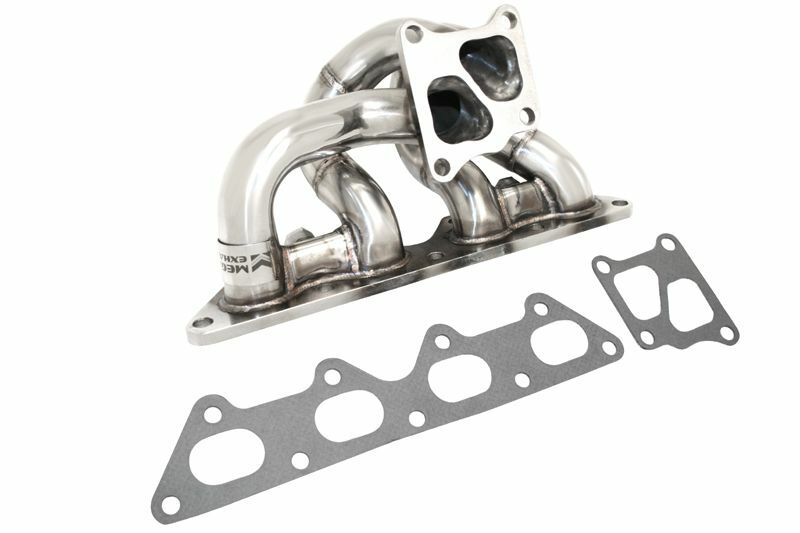 Shopping for a performance turbo manifold? Check out our selection of Megan Racing Turbo Manifolds. Each Megan Racing turbo manifold is made with T-304 stainless steel and utilize mandrel bent piping with CNC Machined Flanges. Every set is flow tested and dyno’ed to make sure the fitment and performance meets our standards. Additionally every Megan Racing turbo manifold features robot tig welded joints for long lasting durability. Finally each turbo manifold comes with 1-year limited warranty. In conclusion we aim to provide you with the best pricing on Megan Racing Turbo Manifold and exhaust upgrades. In other words we want to be your one stop shop for Megan Racing performance upgrades. Our turbo manifolds are available for select applications including Mitsubishi Eclipse, Mitsubishi EVO, Nissan 240SX, Mazda RX7, Mazda Miata and more. Turbo manifolds start at $170 plus shipping. Installation of turbo manifolds can be difficult on some vehicles. Therefore we suggest professional installation only for turbo manifolds. Finally our friendly staff is standing by to assist you with any questions you may have. 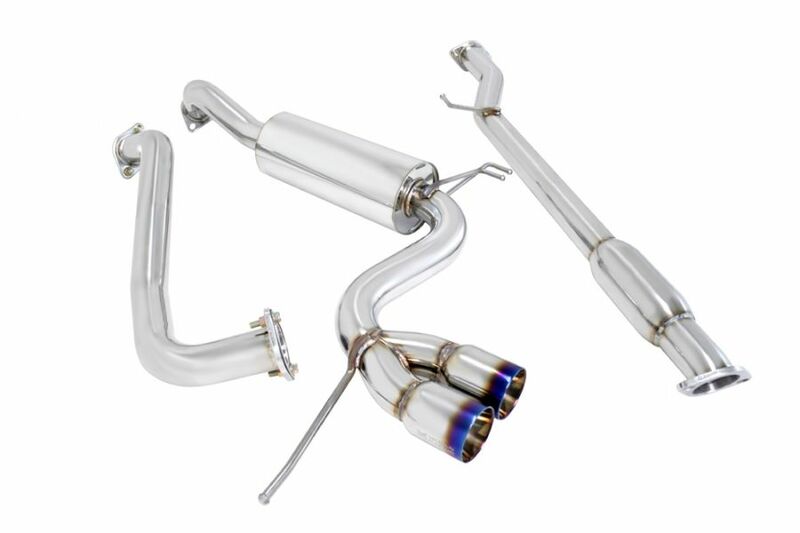 Shopping for an upgraded exhaust system for your vehicle? We invite you to check out this line of Megan Racing Axle Back exhaust systems. For those who like to upgrade their exhaust to their own taste, Megan Racing offers an axle-back exhaust systems. Designed as a direct bolt-on to replace the stock piece, this axle-back system works in conjunction with the OEM Mid-Pipe and is easy to install within minutes. Additionally you can always come back later and buy a Megan Racing mid pipe to make this into a full cat back system. All Megan Racing exhaust systems are constructed of T-304 Stainless Steel polished to a mirror finish. Axle-Back system offers free-flowing performance over your restrictive stock exhaust system. Another benefit is these exhaust systems are much lighter than your OEM exhaust. Power to weight ratio that plays an important role in your cars handling and performance. In other words these exhaust systems are the perfect upgrade when you are just starting to upgrade your vehicle exhaust system. 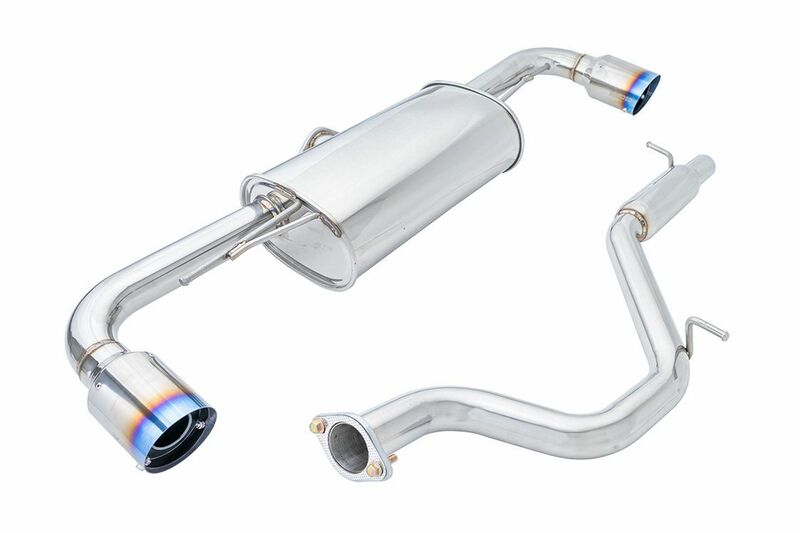 Looking to upgrade the exhaust system on your BMW? Look no further than the Megan Racing Supremo Exhaust Systems. 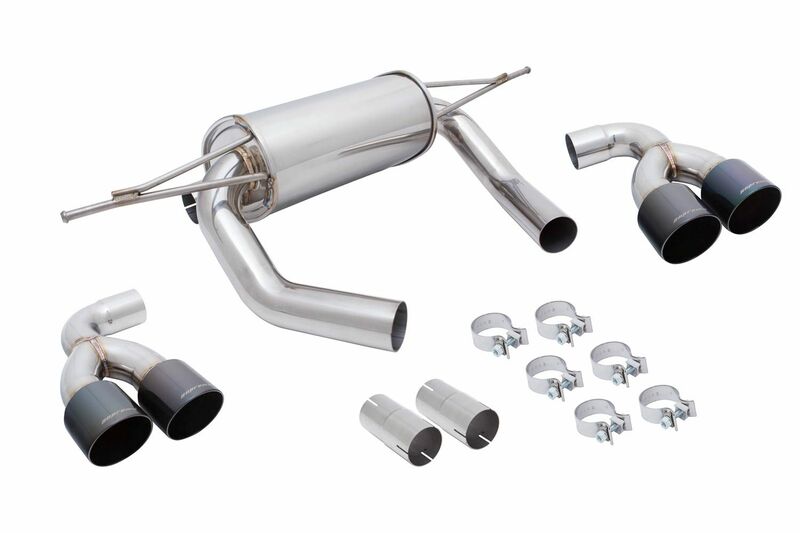 Megan Racing Supremo cat-back exhaust systems are made of T-304 Stainless Steel with mandrel bends. 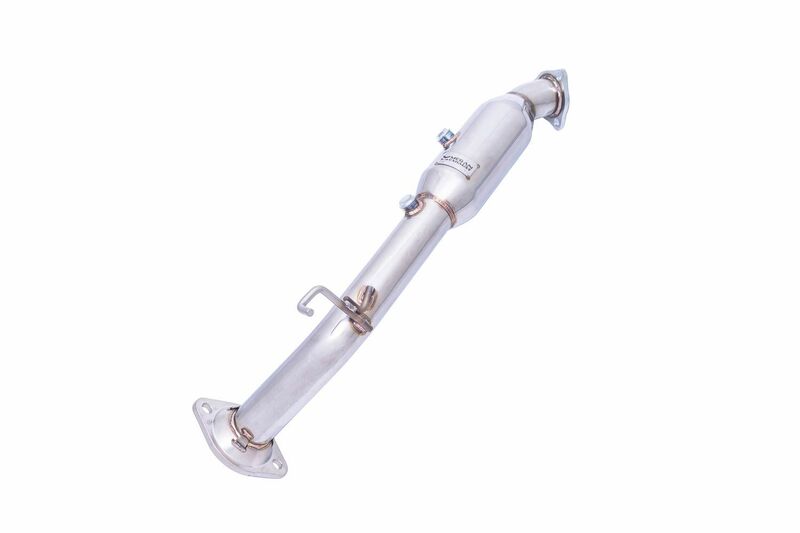 Being constructed of Stainless-Steel, this exhaust piece is much more lighter than your OEM system. Power to Weight ratio plays an important role in the handling and performance of your vehicle. 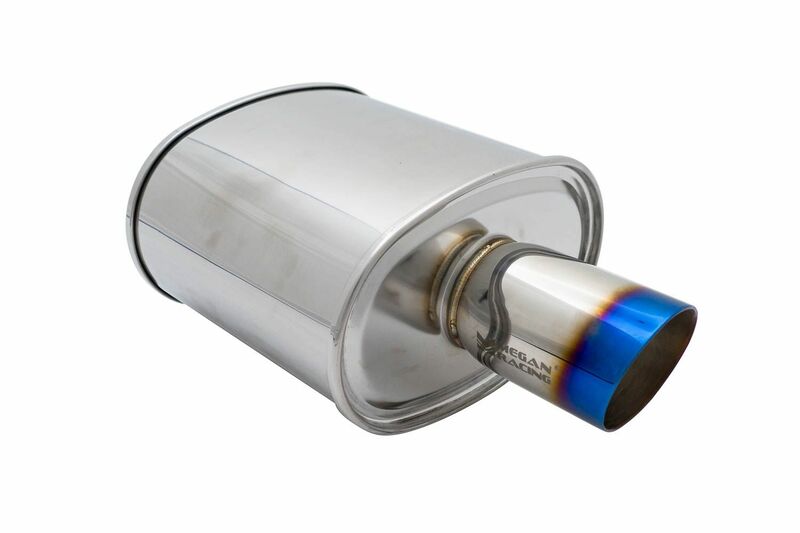 Additionally each exhaust features fully polished surface and CNC machined flanges. Furthermore the aggressive styling and finish options pair well with luxury European vehicles such as your BMW. Finally the deep amazing sound produced by these exhaust systems is something you will never tire of. In conclusion the Supremo Series Exhausts are the perfect blend of style and performance that will take your BMW to the next level. In other words you are going to love this exhaust system! Shopping for a new exhaust system for your vehicle? Look no further than the Megan Racing Type 2 exhaust systems. Megan Racing’s Type 2 Cat-Back Exhausts are made of T-304 Stainless Steel. Additionally these exhaust systems feature full polished surface, CNC machined flanges and piping that is mandrel bent. Megan Racing Type 2 exhaust systems feature aggressive styling as well as a deep and strong tone. Our exhaust systems not only sound great but improve horse power and performance with its high flow straight through design. Finally these exhaust systems come in 2″, 2.5” and 3” piping depending on make and model. In conclusion this is a direct bolt on exhaust system and has a one year limited warranty. In other words this exhaust is the perfect choice for the consumer that wants to add performance and sound without breaking the bank! In need for a new exhaust system but do not want to attract unwanted attention from the police? Look no further than the new Megan Racing black series exhaust systems. With law enforcement becoming ever more strict with modifying your vehicle with performance parts, the need for more discreet performance parts have increased to keep a low profile. This was never more true than in California where in 2019 they have changed the law in regards to modified exhaust. Megan Racing has developed a line of Cat-Back exhausts systems to meet the needs of today’s Low-Profile enthusiasts without sacrificing performance. 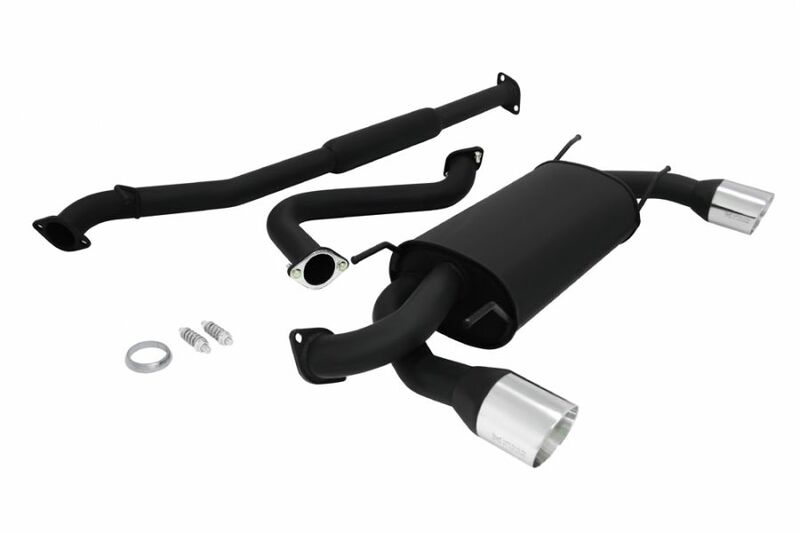 Additionally these exhaust systems are based around our Type-2 and OE-RS exhaust systems. These exhaust systems feature more subtle exhaust tips that are polished to keep the visual aspect of your exhaust up to standard while having the rest of the system, the muffler and piping, coated in a stealthy flat black coating. Additionally the flat black coating also acts as an anti-corrosion layer that will enhance the durability of your exhaust. Furthermore also trapping heat and noise within the piping to increase performance and reduce interior resonance. The tone of these exhausts is much more mellow while still retaining an aggressive tone at wide-open throttle. In the market for a new exhaust system? Look no further than Megan Racing NA Type Exhaust Systems. 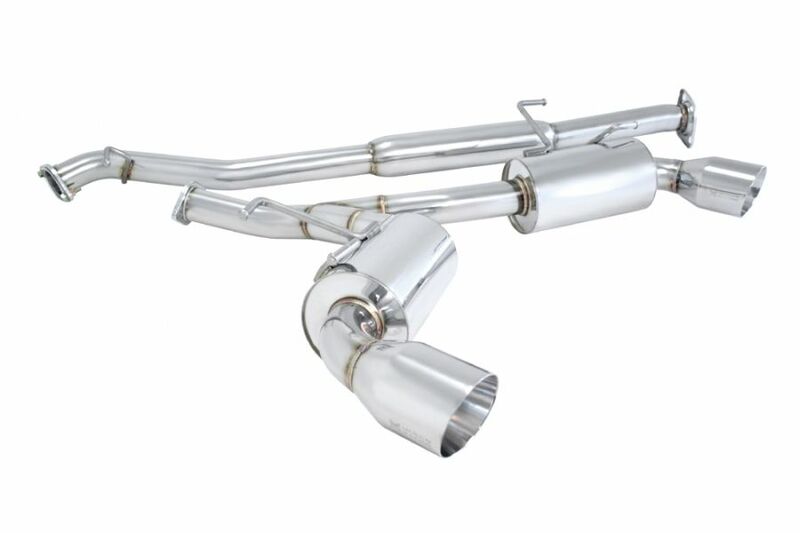 These bolt on exhaust systems complete your exhaust from the catalytic converter back. 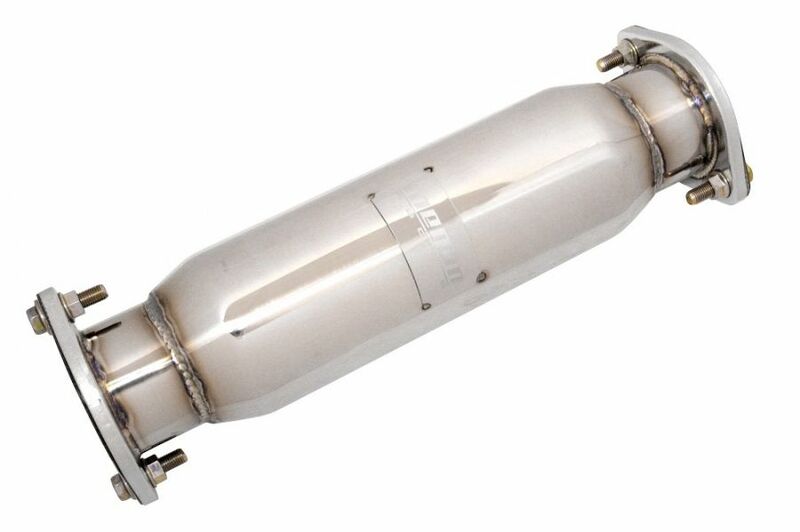 All NA type exhaust systems are constructed in 100% T-304 Stainless Steel. Additionally stainless steel provides for long-lasting durability. Additionally these systems feature smooth bends and a straight-through design for superior performance. Furthermore the built-in resonator and dual-chamber silencer offer a mellow yet aggressive tone for the street. To finish off your ride just right, the polished finish and clean welds offer the perfect show-quality you desire. In conclusion NA Type exhaust systems are designed to extract maximum power from normally aspirated engines. In other words this is a perfect exhaust system for the consumer looking for an upgrade in performance as well as sound.